The Sand Island Petroglyphs for this post are located across Highway 191 from the Sand Island Campground near Bluff, Utah. These aren't the same petroglyphs as the well known Sand Island Petroglyphs but are just one of many panels that can be found along the San Juan River corridor. To get to the area where the panel of petroglyphs are follow Highway 191 out of Bluff. After the highway turns south towards Mexican Water, where Highway 163 continues straight ahead toward Monument Valley, watch for a dirt road on the west side of Highway 191 that comes up just before crossing the bridge over the San Juan River. We hiked over from the campground by going under the bridge so for us it was 2 miles round trip. If you drive to the spot then the distance is of course much shorter. There are several side roads on the left and the right but stay on the one the heads west perpendicular with the highway. 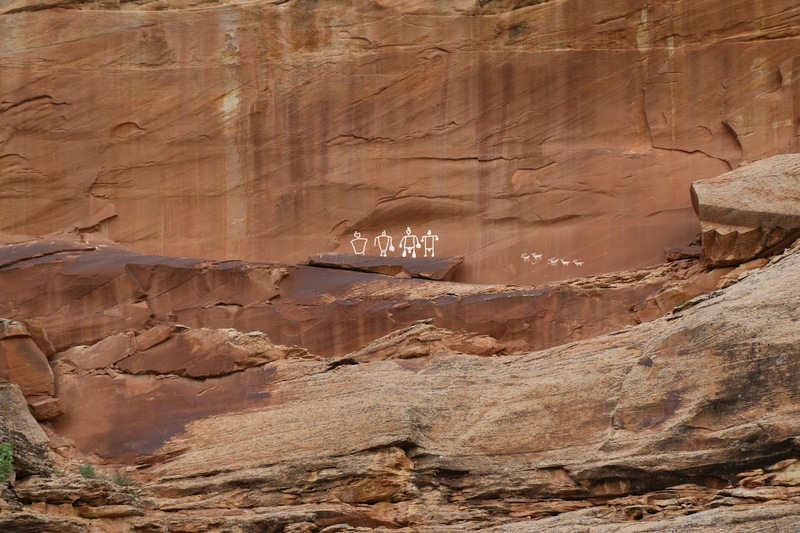 The petroglyph panels are located high up on the cliff above a rock ledge. The main figures are of four big men on the left and some bighorn sheep on the right. From a distance it is hard to make out the four big men but the bighorn are much easier to see. Once you spot the bighorn then look to the left. We have read an old Hopi story that talked about a group of fearsome people that were very large and that had big hands and feet. As you can see the hands and feet are exaggerated in these images similar to those found nearby at the Wolfman Panel. 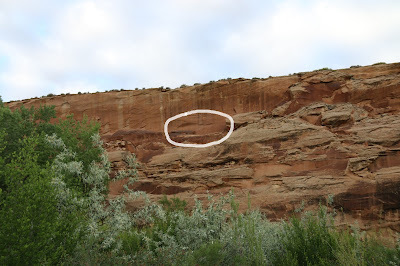 As we mentioned there are petroglyphs all along the San Juan River. If you are interested you will find a few more on the east side of the highway near the road. There are other images in the area besides these but we found the ones in this picture interesting because of the staffs, or sticks, that the figures are carrying. They seemed to have feathers or something else around the top of them and looked like something that a shammon might carry. 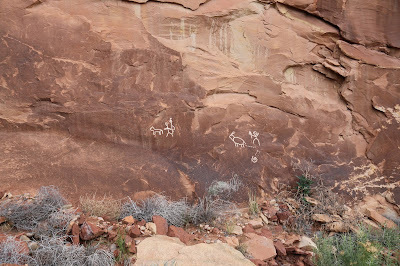 We found these images intriguing because of the Hopi legend that we had read and thought them worth posting for that reason. 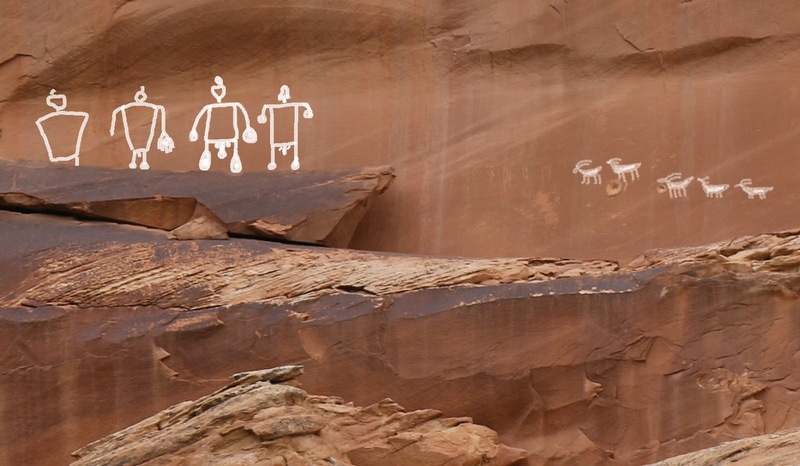 Anytime that you come across petroglyphs that might support a story of ancient origin it tends to make them much more significant and worth sharing for others edification and perhaps research. If you would like to see it for yourself then all you have to do is 'Take a hike'.